These two are Thomas W. & Lucinda (Lough) Roberts or Edward & Mary Ann (Allen) Roberts. Daniel Huff & Elizabeth (Austin) Roberts. Artemus & Elizabeth (Bellangee) Roberts. The children of Daniel Huff & Elizabeth (Austin) Roberts. Don't know who's who so here are the names in order of birth: James Austin, Oliver Nixon, Milton, Thomas Walter, Solomon Whitson, Esther Elizabeth, Alice & Edward. 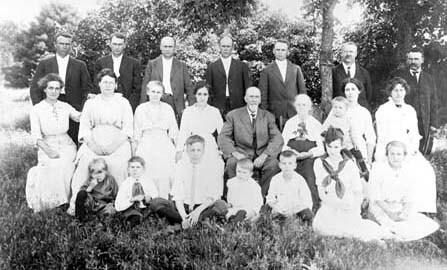 The Family of Artemus ROBERTS. Once again don't know who's who so here are the names of the sons in order of birth: William Colfax, Artemus C., John Milton, James Russell, Daniel Edward, Charles Whitson, & Barton Bellangee. Photo courtesy of Ruth & Dr. Geo Strassler. 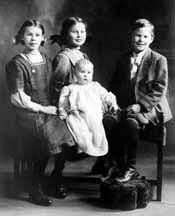 The Children of Daniel Edward & Edith ROBERTS: Romona A., Ruth B., Donald P., & Allen E. ROBERTS. Christmas 1911. 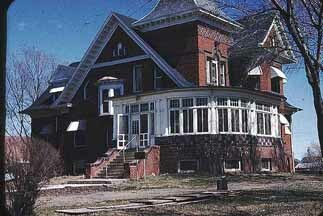 Nebraska National Register Sites in Lancaster County: Fairview was the Lincoln home of William Jennings Bryan, a nationally known political leader and orator, whose house was designed by Lincoln architect Artemus Roberts, and built in 1902-3.